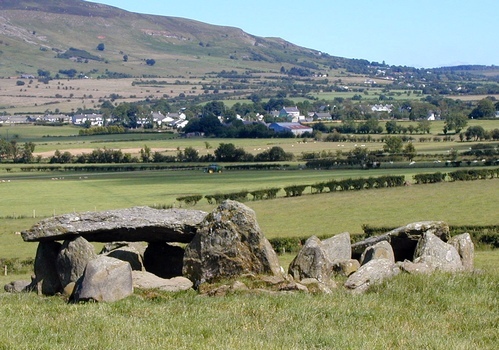 These stones stand just two miles outside the town in the townland of East Carrick. With a splendid view of the distant Sperrins, they have been marking this spot for thousands of years. This was originally a chambered grave and dates from the late stone age. Since then it has been much disturbed and many of the original stones lie in a tumbled heap. I do not know whether the site has ever been dated using modern methods. The dolmen at Carrick East was excavated in July 1936 by J.B.Mullin and O. Davies. They found the remains of six pots and many pieces of flint. They also identified some birch wood charcoal, which may have been used during the cremation of the unknown occupant of the cairn. Here is their paper. If, like me, you enjoy these old places, the link below will take you to a site that lists a lots of Ancient Sites.